In these times where information plays a critical role in disaster resilience, Tagbilaran City innovates with its unique integrated disaster and anti-crime reporting and monitoring system: enter the Communications Line for Emergency Alarms and Response System (CLEAR). An information hub that banners a highly visible light emitting diode (LED) board that has the capacity to broadcast announcements and disaster mitigation tips, the CLEAR announcement board which is remotely controlled from the Tagbilaran City Disaster and Risk Reduction Management Office Command Center, can even remotely broadcast localized specific information, like localized disaster mitigation drills, explains City DRRMO chief Gerard Lavadia. For high priority information, like possibly some evacuation or those needing community mobilization, the CLEAR board installation comes with a siren which can also broadcast loud audio warnings via a public address system and a highly visible flasher for maximum reach. Things like barangay meetings, events, fire drills, earthquake drills and mass casualty incident simulations to better acquaint the communities of the simulations, these can be pre announced to douse out the panic that could result. And each CLEAR hub also packs a host of high definition tilt-able closed circuit television cameras than remotely transmits real-time images to the command center. The cameras can be zoomed and panned to follow through an action, a person in a crime situation and when it is stored in a huge databank or live feeds from nearly a hundred more remote cameras, there is a playback capacity for a better reckoning and crime reenactment to help police investigators determine culpability, Lavadia hinted during this month’s Association of United Development Information Officers (AUDIO) in Bohol on their famed Bisita Opisina into the city Hall’s CDRRMO. And for emergency situations and where there is a need to call for police, firemen or emergency medical services, in the CLEAR information hub is a yellow phone that directly connects the caller to the emergency hotline inside the CLEAR Command nerve center. It is as easy as opening the yellow phone’s swing box and picking the phone up. This immediately rings the command center and the hotline phone operator can immediately talk to the caller, Lavadia, who keeps the nerve center with a wall filled with live camera feeds remotely transmitted from the CCTVs, informed the visiting information officers. They won’t simply get away. According to the CDRRMO, as soon as one picks up the yellow phone, the CCTV camera automatically zooms in on the caller so that the operator can have a direct view of the caller and would know if such were just prank call. The live camera feeds from the 12 CLEAR disaster information hubs all help prop up the city’s anti-crime and disaster resilience capability, Lavadia said. 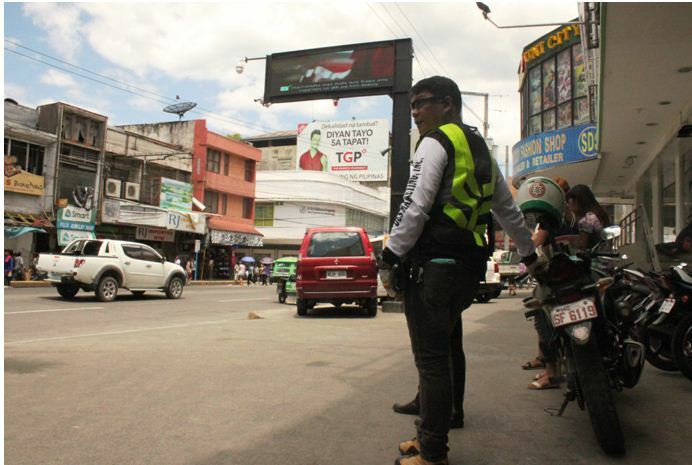 In fact, on lost items inadvertently left on tricycles, even if the commuters do not memorize the body numbers, by simply reporting it to the CDRRMO, the duty officers can pull out specific time-stamped video feeds for playback recording the time the tricycle passed a specific CCTV for facilitated tracking. When a caller requests for any kind of assistance, the CDRRMC can send in law enforcers, vector in emergency responders, or simply direct the caller to the nearest source of help, if only to avail of the service.